Warm waters from “The Blob” in Puget Sound combine with drought conditions as warm air has left little snow to feed the rivers. 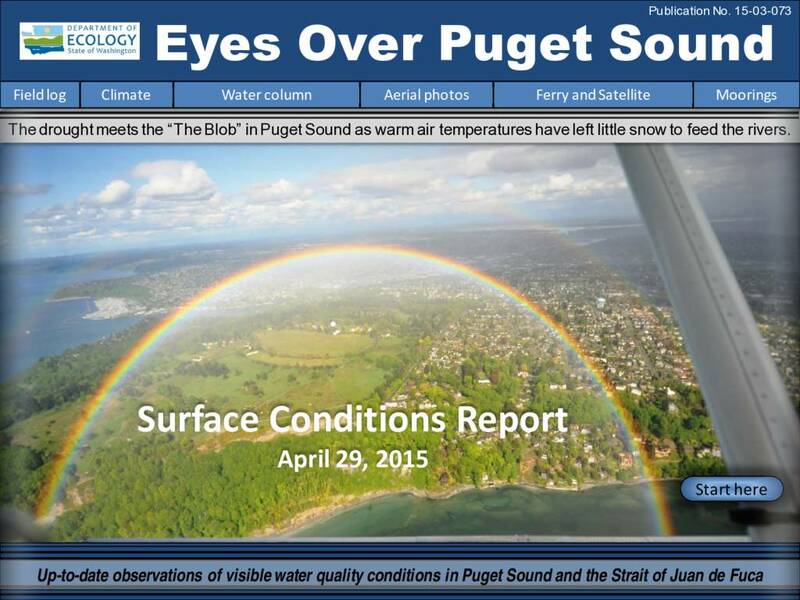 Water temperatures throughout Puget Sound are the highest in 25 years and oxygen is exhibiting record lows. High suspended sediment in the north is still coming in from the Fraser River. Otherwise, the surface waters appear very clear due to recent low river flows and weak blooming activity. A red bloom is present in Sinclair Inlet and in some confined bays. Patches of jellyfish, however, are going strong in inlets of South Sound and Sinclair Inlet. What does this all mean for salmon? Get to know some intertidal critters! Description Warm waters from “The Blob” in Puget Sound combine with drought conditions as warm air has left little snow to feed the rivers. Water temperatures throughout Puget Sound are the highest in 25 years and oxygen is exhibiting record lows. High suspended sediment in the north is still coming in from the Fraser River. Otherwise, the surface waters appear very clear due to recent low river flows and weak blooming activity. A red bloom is present in Sinclair Inlet and in some confined bays. Patches of jellyfish, however, are going strong in inlets of South Sound and Sinclair Inlet. What does this all mean for salmon? Get to know some intertidal critters!